Hygienic: Free from pesticide and antimicrobial additives. Providing child and baby-safe washroom facilities that parents can trust reflects well on any business – particularly in family restaurants, shops and public spaces, where little ones must be attended at all times. 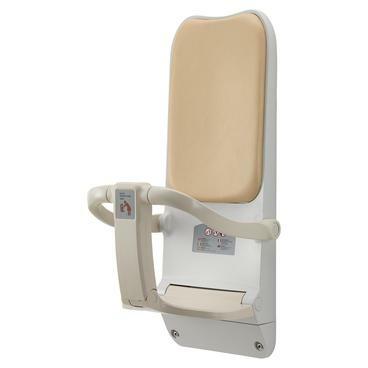 Offering complete peace of mind, our short-base child and baby protection seat gives parents a place to seat their small children safely inside a changing cubicle, toilet or fitting room. Extremely safe – the contoured, ergonomically designed seat with raised side barriers ensures kids will stay put, preventing them from falling and injuring themselves. Snug and secure, the short-base child and baby protection seat has an integral three-point strap with adjustable waist and crotch restraints. Fastened with a snap-lock buckle, there’s no safer place to seat an infant. The compact, fold-away design of our child protection seat makes it a practical addition to any bathroom, while its concealed hinges protect fingers from becoming trapped. Easy to install, even in small spaces – this unobtrusive seat eliminates the uncertainty of leaving a young child or baby unattended, outside or on the washroom floor. All our child and baby protection seats are certified free from pesticides. This child and baby seat comes with our seal of quality approval and a two-year warranty, including free parts and labour should you need it repaired within the first year of purchase.